BKNIX Route Servers consist of BIRD (BIRD Internet Routing Daemon) that support both 2-byte & 4-byte AS number. We recommend to establish sessions with more than one route servers available on the VLANs (possibly all), when one route server goes into maintenance mode, it does not affect your connectivity. We have two networks are IPv4 network and IPv6 network over a dedicated VLAN on the BKNIX infrastructure can be implemented on an existing port with (802.1Q) Q-tagging. 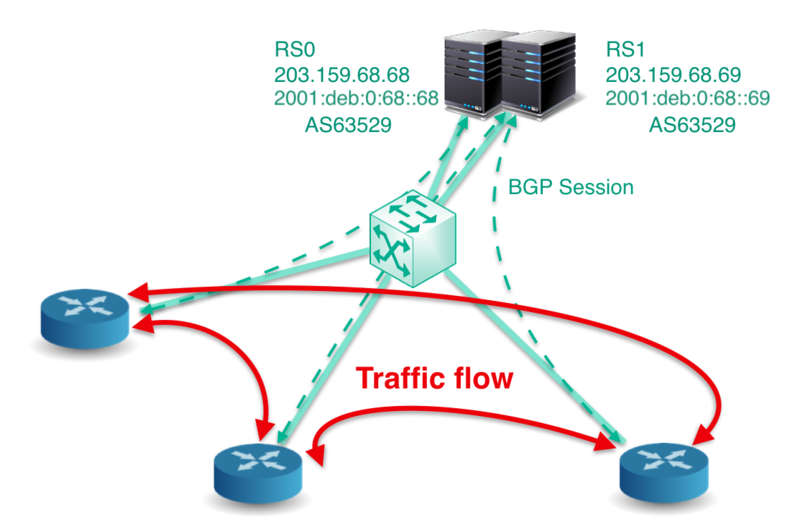 In the "router bgp (your AS)" configuration section of your router to the BKNIX you should add two peers to the AS63529. Set up a peering with the BKNIX Route Servers. Also shown is a sample Cisco router config that can be used to set up this peering with the AS63529 routers. BKNIX Route Servers are MANRS (Mutually Agreed Norms for Routing Security) compliant.